Established by Oct 1, 1859 by 1st Cavalry. U.S.A. under Major Wm. H. Emory. Post evacuated by Federal troops. May 1861, and occupied by Confederate garrison 1862. Hq. for Gen. W.B. Hazen, special Indian Agent, 1868. Gen. Phil H. Sheridan based here Winter 1868-69. 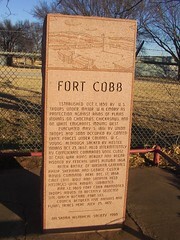 Fort Cobb abandoned by U. S. Army March 12,1969. Estabished Oct.1, 1859 by U.S. Troops under Major W.H. Emory as protection against raids of Plains Indians on Choctaws, Chickasaws, and on white emigrants moving west. Evacuated May 5, 1861 by Union Troops and soon occupied by Confedrate forces under Colonel W.C. Young. Although sacked by hostile indians Oct. 23, 1862, held intermittently by Confederate commands until close of Civil War . Ruins rebuilt and regarrisoned by Federal units autumn 1868. After Battle of Washita, Generals Philip Sheridan and George Custer moved command here Dec. 17, 1868. Chief Lone Wolf and Satanta held hostages until Kiowas submitted. Mar. 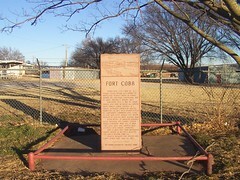 12, 1869 Fort Cobb abandoned, troops moved to recently selected site which became Fort Sill.